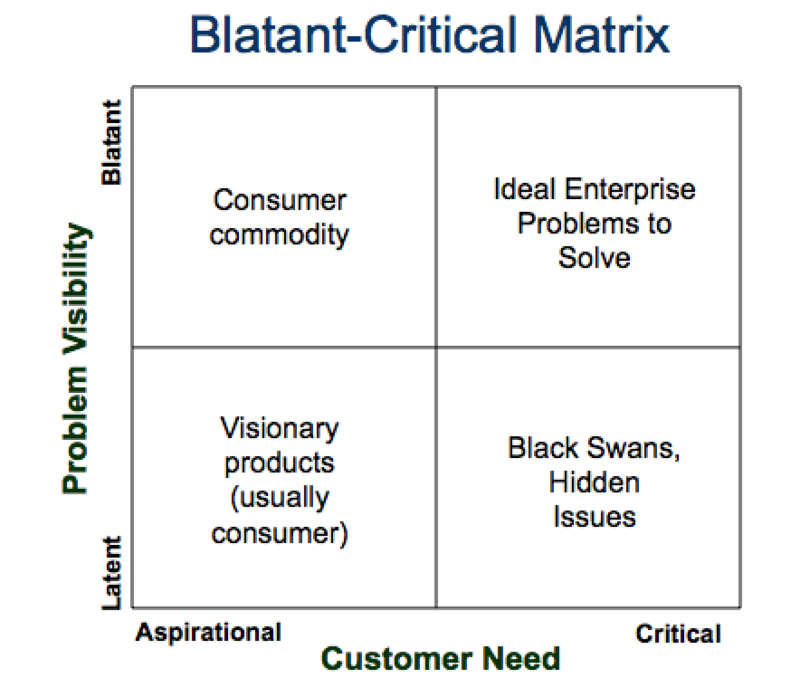 The Blatant-Critical Matrix is a model taught by Mark Skok, a principal at North Bridge Venture Partners. He specializes in working with tech startups selling software into enterprise markets. The matrix is a tool used to help entrepreneurs focus, to help them strip away the barking dogs that cloud their market vision. 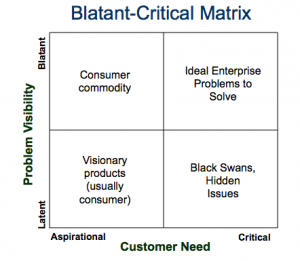 Though his particular focus is enterprise software startups, the concepts of the matrix can easily apply to other markets and be useful in planning exercises. The following is based on a lecture Mr. Skok gave at Harvard. The article version is available here. Enterprise markets differ from consumer markets in key ways. Product features typically are driven by specific technical needs of customers. Cost considerations are crucial. And, issues that are important to consumers, such as color, packaging, and some of the warmer, fuzzier brand attributes are less important in the enterprise world. Mr. Skok says software startups need to ask two question of their solution. The first is “Is it BLAC and white?” “BLAC” is an acronym which asks if your solution addresses customer needs that are Blatant and Critical. “White” is shorthand for “Does your solution address a market white space?” a gap in the market that is not served well by current offerings. Let’s discuss what these mean. Vertical Axis: Visibility. Blatant problems are ones that are obvious to the client. Latent problems are unknown or unacknowledged. Latent problems may well be worth solving, but they require educating the customer about the value of solutions. For a startup software business, that education requirement greatly lengthens the time from first contact to adoption, adding costs most startups can ill afford. Horizontal Axis: Customer Need. Critical problems are important and relevant. They affect business outcomes. People’s careers can be made (or broken) by how such problems are addressed. The customer needs for these problems to be solved now. Aspirational needs are those that meet customer needs for success and social status or prestige. Meeting these needs are not germane to today’s enterprise results. Skok makes the point that Aspirational solutions are crucial in consumer markets where enormous profits come from identifying the unexpressed needs and ambitions of customers. Consumers may not have known they needed cat videos, disappearing photos, or a device carrying 50,000 songs in their pocket, but creating such products unlocked huge markets and profits. Upper left: Blatant/Aspirational. The problem is obvious but not critical. For example, a firm may want to transition its solution to a new interface that addresses future computing trends. But the company may be averse to solving that problem in its current budget. Customers are not ready to pay more for that solution yet. Lower left: Latent/Aspirational: In a sense, this quadrant represents the unknown/unknowns. The market may harbor emerging challenges that have not yet coalesced into a problem for companies or end-customers. These require education and imaginative products in order to build a fire under the prospect. Lower right: Latent/Critical. Unforeseen crises and future challenges reside in the latent/critical corner. These are problems that will hurt results but are not currently in the customer’s frame of reference. Upper right: Blatant/Critical. These are the problems that are affecting financial performance now. Skok says these are the only problems most software startups should try to solve. It’s not enough to identify the Blatant/Critical problem. Solutions that succeed in the market must offer a performance gain great than the cost of changing software in the client company. In Skok’s view customers need a 10x gain in costs, time, and competitive advantage in order to justify the cost and pain of changing solutions. He offers a complete methodology for that analysis. This strategic matrix actually recalls some earlier models in other domains, such as Stephen Covey’s highly influential urgency and importance matrix. Covey’s work on the tradeoffs between tasks that are important (similar to blatant), versus those that are merely urgent (critical) sent many a manager on a lifelong quest to optimize his or her time.